Will Warm Winter Wither Plants? – McLeese Landscapes, Inc. The quick answer is: It depends. In addition to the particular plants involved and your location, how your plants fare depends on how quickly cold temperatures return, how cold it gets, and other environmental factors. “I don’t think we’ve seen the extremes yet that would cause a lot of long-term damage to trees and shrubs,” says George Good, professor emeritus in Cornell University’s Department of Horticulture, and a landscape plant expert who has seen many unusual winters during his long career. A sudden drop to subzero temperatures following the warm weather in early January would have severely stressed many plants, observes Good. But most plants should acclimate OK with a gradual return to more normal winter temperatures, which appears to be happening as of this writing in mid-January. “Some flower buds will be killed. So we may see fewer blooms on flowering trees and shrubs this spring,” predicts Good. That has commercial fruit growers concerned, as they will harvest less fruit if too many flower buds die. But for most of us, it just means we’ll see fewer flowers. See sidebar Making the most of the warm weather (below) for insights from other Department of Horticulture faculty and staff about how the warm winter might affect your lawns, landscapes and gardens, and what you can do to minimize damage in some cases. In the future, chances are good we will see more warm winters like this one, says David Wolfe, a Department of Horticulture scientist who is studying how climate change, caused in part by increasing carbon dioxide levels in the atmosphere, is affecting agriculture in the Northeast. In the Northeast, lilacs are blooming four days earlier on average than they did in the 1960s, Wolfe points out. Warmer temperatures are also affecting cultivated crops like grapes (blooming six days earlier) and apples (blooming eight days earlier). These examples are just the tip of the iceberg in the mounting evidence that the climate is warming. Warmer winters may allow gardeners to grow some plants that before could only grow in milder climes. The wine grape industry, which relies on varieties that are only marginally cold-hardy in upstate New York, may benefit from warmer winters. On the other hand, aggressive weeds and invasive plants will also move north. Studies show those species are better equipped than crops to take advantage of the increasing carbon dioxide levels in the atmosphere that are driving warming, notes Wolfe. Pests and diseases that were held in check by the cold may become more of a problem. Lifecycles of beneficial insects may get out of synch with the pests they help control. Natural ecosystems will shift north, with oak-pine forests replacing maple-beech-birch forests in some places, for example. 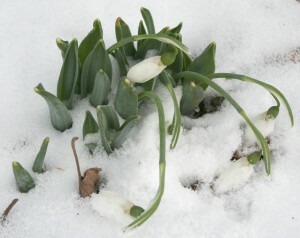 Less reliable winter snow cover may hurt over-wintering of some perennial crops and flowers. Hotter summers may cause heat stress even in warm-season crops such as tomatoes. It’s uncertain if weather variability will increase along with temperatures. But most models predict fewer but more concentrated precipitation events, causing more flooding and drought. For gardeners, adapting to a changing climate may be as simple finding better-adapted tomato varieties or other plants to grow. But for commercial growers, changes are likely to be more involved. “Everyone is going to have to invest some to respond to climate changes,” says Wolfe. For more information, visit: www.climateandfarming.org. Lawns: The good news, says turf specialist Marty Petrovic, is that warm temperatures in early winter encouraged root growth in existing lawns and strong establishment of young seedlings in new lawns planted last fall. The bad news is, if temperatures drop too fast, lush top-growth may be more prone to freezing damage. Petrovic’s advice: Avoid walking on lawns as much as possible until the soil dries out and grass starts growing again in spring. If temperatures return gradually to winter norms, grasses should “harden off” and be fine in spring, says another turf specialist, Frank Rossi. What concerns him most is fluctuating temperatures. Alternate freezing and thawing can kill grasses, especially in low-lying areas where water collects and ice forms. Note those areas now and plan to improve drainage before next winter. Replant other bare spots this spring before weeds have a chance to move in. For directions, visit:www.hort.cornell.edu/gardening/lawn. Fruit trees and grapes: While the picture is more complicated, in general, flower buds on fruit trees and grapes won’t be as cold-hardy this year due to the combination of warm weather and fluctuating temperatures, says fruit specialist Ian Merwin. Many flower buds could be killed if temperatures drop rapidly below zero, reducing flowering in spring and fruit harvests later. For example, Merwin says data from the New York State Agricultural Experiment Station in Geneva show that most years it takes temperatures of -18 F to kill half the flower buds on Concord grapes. In early January this year, the flower buds were more fragile. If temperatures drop to -14 F it could kill half of them. Some fruit trees will be more susceptible to damage this year than others. Fruit trees need a certain amount of cold weather between 32 F and 48 F before warming temperatures make them break bud and flower, explains Merwin. Those cultivars with a short “chilling requirement” could flower with prolonged warm temperatures. “If you go out and look, their buds are swollen, and this indicates they are more vulnerable to cold damage,” he says. Some stone fruit cultivars (peaches, plums, cherries) are especially susceptible, while most apples grown in New York are probably less vulnerable. Merwin suggests putting off any pruning until late February or early March if possible, leaving more flower buds on trees and vines when pruning, and hoping we don’t get a midwinter thaw followed by a severe cold snap. Berries: If you mulched your strawberry patch, the plants should be fine. “They’re mostly oblivious to the weather,” says berry specialist Marvin Pritts, who is also chair of the Department of Horticulture. Blueberries are slow to respond to warming temperatures, so he’s not worried about them flowering prematurely. Blackberries and some raspberry varieties are another story. Like some fruit trees, their chilling requirements may have already been met, their buds are swelling and they’re ready to take off. A rapid chill could freeze the buds, and canes will begin to die from the top down. But even if the entire cane dies, healthy new canes will emerge in spring. “If that happens, this summer’s berry crop would be lost, but the 2008 crop should be fine – weather permitting,” observes Pritts. Perennial flowers: Most bulbs and perennial flowers should come through the winter just fine, says Bill Miller, director of Cornell’s Flower Bulb Research Program. The buds of these plants are at or below ground level, and often protected further by mulch or leaves. Some early-flowering spring bulbs started flowering around New Year’s Day in sheltered gardens in the Ithaca area, including the aptly named snowdrops (Galanthus). “The flowers that opened will probably survive, especially if we get some snow cover before really cold weather returns,” says Miller. Another very early spring bulb, winter aconite (Eranthis), had not even emerged in mid-January. It’s common for the leaves of some bulbs, such as grape hyacinth and early daffodils, to emerge in fall or winter. The leaves may suffer some damage. But the flower buds are still deep underground and well-protected from cold weather. Vegetable gardens: The warm weather in December was great if you planted cover crops or cool-season greens such as kale, says Betsy Ingall, a technician who manages vegetable research plots at the Thompson Research Farm in Freeville, N.Y. But vegetable gardeners and commercial growers should be on the lookout this season for pests they may not have had to deal with following colder winters. One example she cites is a flea beetle that thrives and spreads Stewart’s wilt in sweet corn following unusually mild winters. When planning this year’s vegetable plantings, consider testing some new pest- and disease-resistant varieties that also might perform better during hot seasons, she suggests. Posted in General, Seasonal Information and tagged plants in winter, warm winter.